The FOMC meets today and tomorrow, and will likely vote to continue with its current program of purchases of $85 billion per month in mortgage-backed securities and long-maturity Treasury bonds - "quantitative easing." A few weeks ago, Ben Bernanke publicly articulated some of the economics behind quantitative easing. It's useful reading, but for me it was far from reassuring. The core of Beranke's talk uses empirical work from a paper coauthored by D'Amico, English, Lopez-Salido, and Nelson at the Board of Governors. We can take this as honest empirical work, I think, but we can infer - as usual - that the work was done in part as reverse engineering. Quantitative easing (QE) came before the empirical and theoretical work that was done at the Fed to justify the policy. 1. Expectations/signaling: QE may move asset prices because it signals something about future Fed policy actions that actually matter - through this channel the QE asset purchases don't matter directly. 2. Preferred habitat/scarcity: QE might matter because markets for assets of different maturities are at least partially segmented. Then, central bank actions that change the relative supplies of assets of different maturities will cause the term structure of interest rates to change. 3. Duration risk: The yield curve may typically be upward-sloping because long-maturity bonds are riskier assets - their prices are more volatile. If the Fed removes long-maturity bonds from public circulation, this could remove some duration risk, and therefore make asset holders more willing to bear duration risk at the margin, thus making the yield curve less steep. If you've read this previous post, you'll understand that I don't think that either of (2) or (3) hold water. Certainly (1) does, and I wrote about that in my previous post. Basically, for political reasons QE may constrain future Fed actions in particular ways. To address preferred habitat, we have to think about the asset transformation activities of private financial intermediaries, vs. what the Fed is capable of doing when engaging in the same types of activities. Particular individuals may have well-defined preferences over future payoffs (a preferred habitat, if you like), but private financial intermediaries are in the business of taking assets with particular future payoff streams and transforming them into liabilities with different payoff streams. Banks intermediate across maturities; and derivatives and asset-backed securities are designed to reallocate risk in particular ways, for example. Like private banks, the Fed can also transform long-maturity assets into short-maturity liabilities. If you want to construct a model of "preferred habitat," you need to model intermediation - by the Fed and private financial intermediaries. If QE is to matter in this context - for the better - it must be because the Fed is somehow better at intermediating across maturities than are private sector financial intermediaries. No one has to date carried out such a theoretical exercise. Certainly Vayanos/Vila, cited by DELN, do not do that. In the Vayanos/Vila model, preferred habitat is represented by defining preferences over assets - a poor place to start. On duration risk: This is dubious, for two reasons. First, suppose the Treasury is considering financing its deficit with short-maturity debt vs. long-maturity debt. Why would a choice to issue long-maturity debt imply that the private sector faces more aggregate risk? Second, if the Fed purchases long-maturity bonds by issuing reserves, this does not relieve the private sector of risk, as the Fed's future payments to the Treasury (which have implications for future debt issue and taxes) are more risky. It is hard to see how the private sector can unload risk to the Fed's balance sheet. In general, the term premium is the extra return investors expect to obtain from holding long-term bonds as opposed to holding and rolling over a sequence of short-term securities over the same period. In any case, what you see in Bernanke's chart is: (i) a slow decrease in the measured expected average inflation rate, beginning in 2007; (ii) a decrease in the expected average real short rate from about 1.5% in 2007 to about 0% today; (ii) a volatile term premium that declines into negative territory beginning in the latter half of 2011. Bernanke wants to claim credit for that term premium decline - he thinks that's driven by QE. But do we trust the measurement? I'm finding it hard to square what DELN and Bernanke are seeing with what I can eyeball in the 10 year nominal bond and TIPS yields, and in the inflation data. Here's a plot of the breakeven inflation rates from the 10-year bond yield data, and the twelve-month pce inflation rate (I know that TIPS is contingent on the CPI - I used PCE here for a specific reason). 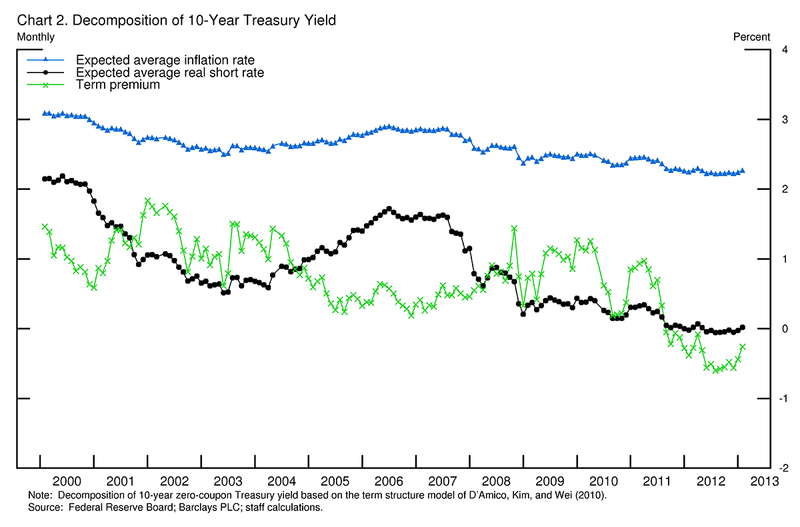 Before the recent recession, the breakeven rate seemed roughly consistent with the average rate of inflation we were actually observing. And the breakeven rate has roughly returned to pre-recession levels, which might lead us to believe that the expected average inflation rate is about at what the average was for 2003-2007, which my eyeball tells me is 2.6-2.8%. 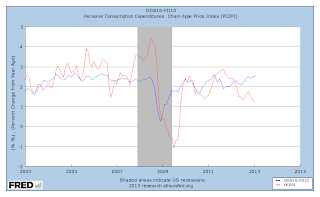 But Bernanke is telling me that anticipated inflation has fallen, to about 2.2% currently. 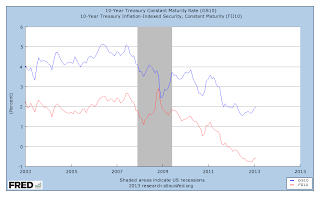 Next, let's look at the raw 10-year nominal and TIPS yields. Note in particular that Bernanke is telling us that the TIPS yield has dropped by about 2.3 percentage points from the end of the recession, but he wants us to believe that the expected average real short rate has dropped by only 1.5 percentage points. We are supposed to believe that 10-year TIPS prices are so high because TIPS have become really scarce and/or because market participants think there is less duration risk. Well, to the best of my knowledge, the Treasury has been working away to extend the average duration of the government debt, and that effect outweighs the effects of Fed asset purchases, on net. Thus government/Fed actions have made long bonds less scarce. Further, the contortions the Fed is going through would surely make most market participants more uncertain about real future rates, which would tend to increase any duration risk that might exist out there. 1. DELN estimate their model for the period 2002-2011. Obviously the monetary policy regime changed dramatically after the financial crisis. How can we think of the pre-2008 data as useful for thinking about the problem? 2. The current scarcity of safe assets (for use as collateral and in financial exchange) implies that Fisher relations don't hold, so inflation premia aren't going to work as in the crude theory outlined in DELN. 3. The key problem is that the Fed is lacking a structural model. They need a model that can successfully explain the term structure of interest rates, and capture the key details of how monetary policy works - both pre-crisis and post-crisis. Without that QE, and attempts like Bernanke's to rationalize it, are just mumbo-jumbo. Is there a way out? Here's one thing that could help. As I have argued for some time, the Fed should reduce the interest rate it pays on the roughly $1.7 trillion of banks' excess reserves. If it did so, banks would keep less cash on deposit at the Fed. The liberated funds would probably flow mainly into the money markets, but some would probably find their way into increased lending—which would give the economy a little boost. In either case, if banks wanted to hold fewer reserves—a Fed liability—the Fed could, and naturally would, shrink its assets by an equal amount. Balance sheets do, after all, balance. And that would make the eventual exit easier. This is incorrect. No funds are "liberated" if the Fed reduces the interest rate on reserves. Outside money (currency plus reserves) does not go away unless the Fed actually sells assets. For example, a reduction in the interest rate on reserves from 0.25% to 0% would reduce the willingness of financial institutions to hold reserves, but that can only mean that, ultimately, that currency will increase and reserves will decrease by the same amount, in nominal terms. Prices would have to change as a result. For example, suppose that the demand for currency is fixed in real terms. Then prices have to rise as a result of the reduction in the interest rate on reserves. The balance sheet would be smaller, in real terms. Obviously this is not a "way out," as the key problem has to do with what happens if inflation gets too high and the Fed needs to tighten. See my post on The Balance Sheet and the Fed's Future. I'm certainly on board with that. We need vision, but the government needs to find a practical path to getting things done. Government needs to be wise and innovative. There are elements of American society that are a mess and need to be fixed, and some of that fixing needs to be done by the federal government. A lot of progressives are Keynesians and, not surprisingly, Jeff Sachs appears to be one too. But Keynesians come in many different types. John Taylor is a Keynesian. Ben Bernanke is a Keynesian. So is Greg Mankiw. There are New Keynesians, like Mike Woodford and Mark Gertler. More than likely, if we could re-animate Keynes, he would have a hard time recognizing his work in any of what those people do. Though Jeff Sachs is a Keynesian, he views himself as a particular kind of Keynesian, and he has taken issue recently with Keynesians he calls "crude Keynesians." Sachs recently wrote this post, which I found interesting. It's pretty bold, actually, and I agree with most of it. The gist of Sachs's piece is in line with some arguments I have made here. For example read this. (4) The belief that for practical purposes, the most urgent need is to raise aggregate demand rather than to focus on the quality and type of public spending. Sachs characterizes the problems of the U.S. economy as structural, and not the result of some sort of "aggregate demand deficiency." What are some of the structural problems? These include large-scale offshoring of jobs, large-scale automation of jobs, decline in demand for low-skilled workers, skill mismatches, broken infrastructure, and rising global energy and food prices. These require various kinds of targeted public investment spending, not simply aggregate demand. The US economic emergency in late 2008 and early 2009 wasn't really an aggregate demand crisis but a financial crisis. That should be pretty obvious, but many people don't seem to get it. Predictably, the usual cast of characters is calling Sachs an idiot. Someone should take him out to lunch and give him a pat on the back. The Fed's balance sheet has changed in important ways - both in size and composition - from what existed before the financial crisis. As well, other elements have been added to the policy mix. Most importantly, the Fed now pays interest on reserve balances. Taken together these changes work to make monetary policy work differently, in some respects. In other respects, policy actually works in roughly the same way, though one might think it would work differently. Changes in the balance sheet, and the payment of interest on reserves, will in the future matter for how policy decisions are made, and potentially for Fed independence. So it is important for us to figure out what is going on. You can see clearly the nature of the changes in what our central bank is doing. The Fed is a financial intermediary - though it has some key properties that distinguish it from commercial banks, for example. Whatever intermediation the Fed is doing, there is much more of it now than in early 2007, as the size of the balance sheet has increased by a factor that is now getting close to 4. Indeed, if the Fed's current asset purchase program - which proceeds at the pace of $85 billion per month in purchases of long maturity Treasury debt and mortgage-backed securities (MBS) - continues until the end of the year, as expected, then the peak increase in the size of the balance sheet should be a factor of about 4.8 (nominal) using January 2007 as a base period. As well, the composition of the balance sheet has changed - on the liabilities side, and on the asset side. In January 2007, the liabilities of the Fed consisted primarily of currency. Essentially, the Fed was providing a medium of exchange to people in the rest of the world (about 50% of the stock of U.S. currency is thought to be held abroad), drug dealers and other evasive types, and U.S. residents who still like to use currency in transactions. With the proceeds of currency issue, the Fed was financing a portfolio much more heavily-weighted (than is the case now) to short maturity government debt. 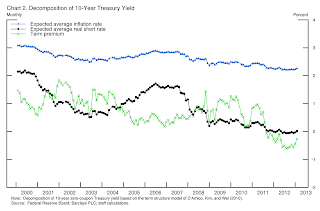 In January 2007, the Fed held a substantial quantity of short-term T-bills, and the Treasury bonds it held were more concentrated than now in shorter maturities (average duration is not in the numbers above, but it has significantly increased). In January 2007, a relatively small quantity ($12 billion) was held overnight in reserve accounts at the Fed. Reserves are used as a medium of exchange among financial institutions during the financial trading day. In January 2007, the average dollar quantity of transactions over Fedwire, the Fed's daylight payment system, was about $2.4 trillion per day, whereas annual nominal GDP in 2007 was about $14 trillion. If the average daylight quantity of reserves was $12 billion (not quite right, as $12 billion is overnight reserves, but it's in the right ballpark) in January 2007, then the transactions velocity of reserves at that time was 199. Compare that to an estimate of 1.5 for March 2013. This is the sense in which we are now awash in reserves. In January 2007, overnight reserves served no purpose but to fulfill reserve requirements, which banks were doing their best to avoid (through sweep accounts for example). With fed funds trading at 5.25% in January 2007, the opportunity cost of $12 billion in reserves held at 0% was substantial. In January 2007, policy was implemented through the System Open Market Account (SOMA) as follows. The New York Fed would each day make a forecast of what the demand for reserves would be on that day, given the fed funds rate target it was attempting to hit, as per instructions from the FOMC. Then, the Fed would conduct open market operations - primarily using short-term government debt (even more specifically, primarily intervening in the overnight repo market). Thus, the idea was that moving the fed funds rate up, for example, required an open market sale of short-term government debt, adjusting for temporary and permanent shifts in the demand for reserves. A lot went into this intervention mechanism, including the cooperation of the Treasury in managing its reserve accounts with the Fed. A key feature of the monetary regime that existed in January 2007 is that the size of the balance sheet mattered. Any asset purchase by the Fed would essentially be reflected ultimately in an increase in the stock of currency in circulation. The quantity theory of money was at work, with increases in the quantity of currency reflected ultimately in proportional increases in prices (everything else held constant). Of course there are short-run non-neutralities of money to worry about, and predictable and unpredictable shifts in the demand for currency. The latter factor explains why the Fed was in the business of targeting the fed funds rate and not some monetary quantity in order to control inflation. 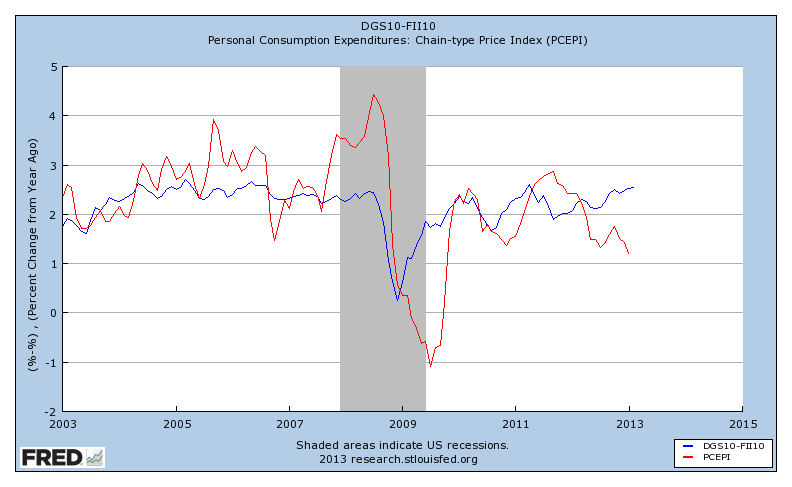 It's also important to emphasize why monetary policy mattered - fundamentally - in January 2007. As mentioned above, the Fed is a financial intermediary, indeed a large one relative to other financial intermediaries that are active in US financial markets. Suppose, however, that the Fed had the same technology, and operated under the same regulatory constraints as private financial intermediaries. For example, suppose that the Fed were operating in early 19th century Scotland, or in Canada before 1935. Under those monetary regimes, private banks were permitted to issue circulating paper currency. If a central bank were to set itself up in such a monetary regime, and it were to issue currency as liabilities in order to buy government debt, that should have no important effects. Why? Because the central bank would have no special advantage in that type of financial intermediation over private sector intermediaries. Any actions by the central bank would be undone by profit-maximizing private banks. Why did monetary policy matter in January 2007? Because the Fed has a monopoly over the issue of circulating currency. If the Fed essentially issued currency to buy government debt in January 2007, that would have been an activity that private financial intermediaries could not engage in. Explicitly or implicitly (there's some subtlety I won't get into here), private financial intermediaries cannot issue liabilities that look like Federal Reserve notes, or the stuff produced by the U.S. Mint. Long-maturity government debt, while comprising a large fraction of the Fed's asset portfolio, did not play an important role in Fed policy in January 2007. The Fed would typically buy new bonds as old ones matured, and did not do much to manipulate the average duration of the SOMA bond portfolio (here I'm doing some guessing, as I have not seen the numbers). Fast forward to March 2013. As mentioned above, the balance sheet is much larger than it was earlier, there are no T-bills on the balance sheet, currency has grown but reserves have grown enormously, T-bonds of longer duration play an important role in the portfolio, and the Fed is holding a large stock of MBS which are backed by private mortgages. The Fed not only looks like a bank - it's also an important mortgage lender. As well, since October 2008, the Fed has been paying interest on reserves at 0.25%. What's important about the changes we have seen since before the financial crisis? I'll organize this as a series of questions, and the answers to those questions. How does monetary policy work now? There's a sense now in which, at the margin, the size of the balance sheet does not matter. If the interest rate on reserves (IROR) stays fixed, then if the Fed purchases T-bills with reserves, that increases the size of the balance sheet, but should be irrelevant. That's a liquidity trap, which exists if there is a positive stock of excess reserves, whether the IROR is 0.25%, 5%, 10% - whatever. Why is there a liquidity trap? We're currently operating under a floor system, in which the IROR essentially determines the overnight interest rate - with some arbitrage frictions for institutional reasons - but in any case the IROR is currently determining short-term nominal interest rates. What's determining prices then? First, under this regime, short-term government debt is roughly identical to reserves held overnight, so think of those two assets as perfect substitutes. Further, reserves are convertible one-for-one into currency (by banks holding reserve accounts). Thus, in spite of the fact that reserves and short government debt bear interest (more as the IROR rises), all of those assets are essentially perfect substitutes given the IROR. Thus, think of the price level as being determined by the demand and supply for currency+reserves+short-term government debt. With a fixed IROR, an open market purchase of T-bills does not change the supply of the relevant asset quantity, and so nothing happens. However, increasing the IROR increases the demand for the relevant asset and reduces the price level. That's how we get inflation control in the current context. But notice something else important. If the Treasury increases the quantity of T-bills in circulation, that increases the price level. Under a floor system, fiscal policy actions have consequences for inflation, though of course that can be offset if the Fed moves the IROR in response - more T-bills, higher IROR. But what if the Fed buys T-bonds with reserves, as it is currently doing on a regular basis? Clearly the T-bonds don't look like T-bills, which look like reserves. T-bonds yield a flow of future coupon payments, and a face value at maturity, which could be up to 30 years from now. But it's straighforward for a private financial intermediary to turn the T-bond into something that looks like T-bills and reserves. A special purpose vehicle (SPV), for example, could be set up by a private financial intermediary which purchases T-bonds, and finances its portfolio with overnight repos, that it rolls over. Those overnight repos look a lot like reserve accounts. So, recall my argument from above about why monetary policy mattered in January 2007. It mattered because the Fed could do something the private sector was incapable of, or prevented from doing. Is the private sector capable of turning T-bonds into overnight assets in basically the same way the Fed does it? You bet. Future research might reveal an explanation, but none of the excuses to date for quantitative easing (QE) - e.g. "preferred habitat," "portfolio balance," "you just see it in the data" - hold water. If QE doesn't matter, then that's even more striking than the liquidity trap phenomenon I discussed above. What determines the price level in a floor system is the demand and supply of all assets that can be intermediated and transformed into assets that are used in exchange. Thus, asset swaps of reserves for government debt (of any kind) are irrelevant in a floor system, and the IROR is the only monetary policy instrument we should be concerned about. The Fed's current predicament is that it has determined that the inflation rate is too low, but if the only policy instrument available is the IROR, there is nowhere to go if the Fed won't reduce the IROR below 0.25%. Even if it reduced the IROR to zero, that would have little effect. Mike Woodford is correct in recognizing that "forward guidance" is the only game in town right now for monetary policy, if the Fed wants more accommodation. However, Woodford's ideas are different from mine concerning how monetary policy works, and where the key current economic inefficiency lies. Our key problem is that there is a high demand for the whole spectrum of U.S. consolidated government debt - currency, reserves, short-term debt, long-term debt - relative to supply. The demand is high because the supplies of other safe assets in the world - asset-backed securities, the sovereign debt of other countries - have been destroyed, and are coming back very slowly. What is needed is a large increase in the stock of U.S. government debt outstanding. But that increase should be temporary, much like the temporary liquidity injections by central banks that solve short-term financial market problems. So what we would like is a deft injection of government debt, which can be withdrawn when the time is appropriate. Of course, this is just wishful thinking, as the U.S. Congress could not be characterized as deft. Does the size of the Fed's balance sheet matter now? If we confine attention to pure economics, the answer is no. To start, one concern that seems to be floating about is that having the Fed pay interest on a large stock of reserves presents a problem, in part because the Fed is giving something away to private financial institutions - somehow subsidizing them. However, part (if not the only) motivation for paying interest on reserves is efficiency. Though the banking sector is highly distorted for various reasons, presumably paying interest on reserves increases economic welfare by removing a distortion. Are interest payments on reserves a subsidy? No more than the interest payments on the government debt represent a subsidy. Suppose, for example, that the IROR is 5%, in which case we would expect T-bills to be trading at an implicit interest rate of slightly less than 5%. If the Fed then swaps reserves for T-bills, basically the same financial institutions which were holding the T-bills would then be holding reserves, and there would be no economic consequences. However, the Fed would be paying more interest to those financial institutions, and the Treasury would be paying less. In terms of the flow of interest payments from the consolidated fiscal and monetary authorities (Fed and Treasury) nothing has changed. The same arguments apply to purchases of long-term Treasury debt, though here the argument is a little more complicated. As discussed above, to a first approximation swaps of reserves for long-maturity government debt are irrelevant under a floor system. Thus, the size of the balance sheet is irrelevant - economically. But is there risk associated with the current state of the Fed's balance sheet? Yes, but possibly not for the reasons you think. The Fed is currently even more profitable than it was pre-financial crisis. 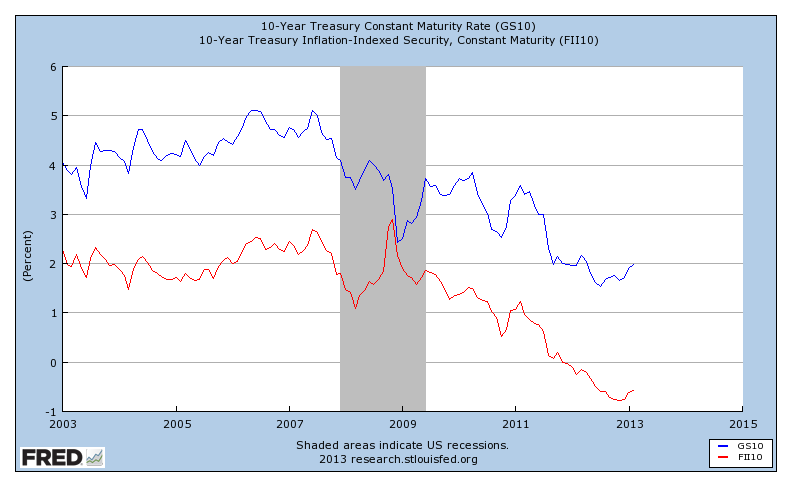 While the Fed is paying interest on a large stock of reserves, and the yields on the bonds in its portfolio are historically low, the IROR is only 0.25%, the Fed's asset portfolio is much larger, and the average duration of the portfolio is much higher, thus exploiting the upward-sloping yield curve. If the Fed were a private bank, we might worry about what it is doing. The Fed is intermediating across maturities, and is now facing greater maturity risk than previously, given the longer average duration of its asset portfolio. But the Fed is not a private bank, and its liabilities are not standard debt claims. Neither currency nor reserves are a claim to anything. The Fed's "liabilities" are not promises of any kind, and so there are no promises to break - the Fed cannot default. Indeed, currency and reserves are more like private stock, with zero dividends. Just as with private stock, the Fed can buy back currency and reserves, by selling assets, and such buybacks will affect the value of the outstanding "shares." But what happens if the Fed needs to tighten, increasing IROR? Is is possible that the Fed's income transfer to the Treasury could fall to zero? If so, for how long, and why would this matter? Fortunately, the Fed is thinking about this problem too. A recent paper written at the Board of Governors supplies the relevant institutional details, and gives projections of Fed income under particular assumptions about future interest rates and Fed asset purchases and sales. According to the projections, which possibly are too optimistic, the Fed will face a two or three-year period starting within a few years where transfers from the Fed to the Treasury fall to zero. If this happens, the Fed will begin booking "deferred assets," which are basically accounting entries so that the Fed's books balance. What will actually be happening is that the Fed will be relying on its ability to print money to pay its bills. All of this is economically irrelevant, for reasons stated above. But of course it's not politically irrelevant. The Fed has enemies in Congress who would be all too willing to pillory the money-losing Fed and to curtail its power. The Fed understands this of course, and will do all it can to keep its income high. But that might mean holding the IROR at too low a level for too long, and thus risking excessive inflation. Thus, the Fed has put itself between the rock and the hard place, and has gained little in the process. The expansion of the balance sheet through various rounds of QE and twisting has accomplished essentially nothing, and now the Fed could be faced with an unhappy short-run tradeoff - the risk of loss of independence vs. the risk of inflation. Is higher inflation really a risk? If it were, why hasn't it reared its ugly head? Given my discussion above, we will get more inflation when the demand for total consolidated-government debt (currency, reserves, government debt) falls. This will happen as the prices of real estate increase in the U.S., the U.S. economy recovers further making bank lending more attractive, and as European governments in particular get their fiscal houses in order. All of this is occurring much more slowly than I think anyone expected, which is why we're not seeing a higher inflation rate. Perhaps the Fed is tougher than I think it is. Maybe that's why typical measures of anticipated inflation show no cause for alarm. But the majority of FOMC opinion seems on the reckless side to me - there's a willingness to experiment with grandiose policies which, in the case of large-scale asset purchases, have dubious science behind them. What about targeted asset purchases? Charles Plosser, Philadelphia Fed President, has spoken (see this speech and this one) about the dangers of expansion in the Fed's perception of its mission. The Fed now has in excess of $1 trillion in MBS on its balance sheet - a quantity that exceeds the total value of the SOMA portfolio held in January 2007. Plosser - I think correctly - points out that the purchase of what are essentially private assets (MBS issued by Fannie Mae and Freddie Mac, with the MBS representing claims on underlying private mortgages) is dangerous for a central bank. If MBS purchases work as intended, then those purchases will act to redirect credit and resources away from other sectors and toward the housing sector. These obvious redistributional effects open the door for lobbying from various private-sector industries and individual corporations for help from the Fed. Either the Fed gives in to demands like that, or members of Congress and the Executive Branch could intervene to accomplish goals through Fed action rather than - more appropriately - Congressional action. The Fed may yet dig itself out - those people are pretty smart. But I think there is plenty of cause for concern. I'm as interested as you are in the outcomes.